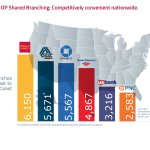 Shared branching began with an undeniable idea: Individually, credit unions couldn’t provide competitive branch networks. But together, they could. Back in the 1970s and 80s, when shared branching took root, locations were everything – and the economic advantages to cooperative branching were easy to see. Fast forward to 2018. In an era when digital banking and mobile payments are becoming the norm, are the advantages of shared branching still obvious? “If anything, it should be more valuable than ever to participate in a shared branching network,” says Shazia Manus, Chief Product and Strategy Officer at CO-OP Financial Services. 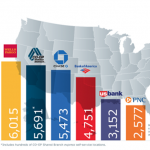 “Seventy percent of consumers – including Millennials – choose their financial services provider based on branch proximity.” About 1,800 credit unions nationwide participate in CO-OP Shared Branch, forming the second largest branch network in the country – ahead of Bank of America and Chase, and second only to Wells Fargo. CO-OP Shared Branch is currently undergoing a revamping and updating that will include technology and service upgrades to integrate the network more seamlessly into the CO-OP ecosystem. Among the benefits will be a streamlined client experience, and improved data analytics and reporting. Fraud detection based on machine learning will provide a significant boost in security. And new approaches to self-service technology and innovation will encourage new ideas from both inside and outside the industry. CO-OP’s shared branching transformation is part of the company’s larger effort to create a unified ecosystem that includes credit and debit processing, ATM network, call center and shared branching – as well as new initiatives that will aggregate data, promote new business intelligence tools, deploy new security technology and unveil a new client experience. The goal is for the totality of CO-OP’s networks, products and services to work together as a seamless whole, to create a better experience for clients and their members, and to facilitate continuous innovation going forward. That value – of people helping people and credit unions helping credit unions – is the heart of shared branching. And while CO-OP is undertaking substantial changes to upgrade the shared branch experience, the core concept behind the network remains constant: Credit unions can compete and grow by working together. To learn more about CO-OP Shared Branch and how it can help your credit union transform and grow, contact your CO-OP representative or email us at sales@co-opfs.org.